Heat dutch oven to 325 degrees for frying. Melt butter and saute onion until translucent. Gradually add milk, stirring constantly until thickened. Add pepper and seasoned salt. 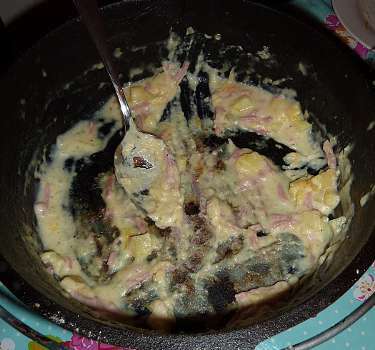 Mix in ham and potatoes to coat well. Sprinkle cheese and bread crumbs on top. Cover and Bake at 400 degrees for 20 minutes. Let me know how you enjoyed your Au Gratin Ham and Potatoes! Awesome meal dutch oven meals the original one pot meal! This will be easy to do at camp too all ingredients are period correct except seasoned salt!